Our Public Community-Share Offer is now live. We’ve already raised £280,000 to buy a small farm of 13.5 acres of land, plus farmhouse. Now help us raise the remaining £30,000 to equip the farm with polytunnels, equipment and livestock to make it flourish. 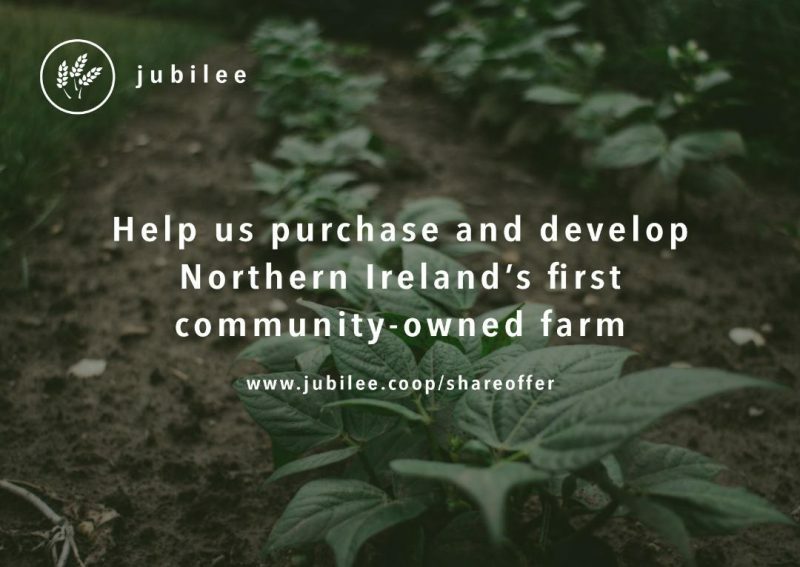 As a Community Benefit Society – a form of cooperative social enterprise – we’re raising this money via a community share offer, making this the first community-owned farm in Northern Ireland. 5% discount on VegBoxes OR the Pig Club for one year, open to those investing in this share offer only. Have name on a “Founder Members’ Ribbon” that will be tied to the branch of the “Members’ Tree” at Jubilee Farm on the first Members’ day. Invitation to quarterly Members’ days, during which Members are invited to take part in guided farm walks and participation in seasonal farm tasks. Free Monthly Jubilee Farm E-Newsletter to keep you updated with Jubilee Farm news, activities, and developments. Opportunity to attend and participate in our AGM. The optimum target of our share offer is £145,000, while our minimum target is £110,000 and our maximum target is £225,000. All Members should regard these shares a long-term investment. They may apply to a minimum of 50 to a maximum of 20,000 shares at £1.00 each, payable in full on application. Anyone aged 16 or above can invest. Organisations, clubs or companies can invest too. Please examine all of these documents before purchasing community shares. You can then fill out the application form and submit along with payment via Cheque or Bank Transfer. Please note that due to technical problems we can no longer take online payments and we apologise for any inconvenience this may cause.